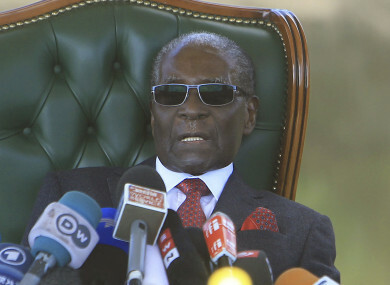 Former Zimbabwean President Robert Mugabe. About 5.5 million people were registered to vote in this southern African nation anxious for change after economic and political paralysis during the nearly four-decade rule of 94-year-old Mugabe. Mugabe stepped down under military pressure last year. Mugabe said he would not vote for his successor. Speaking at his mansion in Harare yesterday, he said he hoped the election would “thrust away the military form of government”. The two main contenders are 75-year-old President Emmerson Mnangagwa, a former deputy president who took over after Mugabe, and 40-year-old Nelson Chamisa, a lawyer and pastor who became head of the main opposition party a few months ago after the death of its leader Morgan Tsvangirai. A record of more than 20 presidential candidates and nearly 130 political parties are participating in the election If no presidential candidate wins 50% of the vote, a runoff will be held 8 September. Dozens of people have been waiting in line to vote outside many polling stations in Harare, the capital, today. Thousands of election monitors have fanned out across the country to observe the process. Opposition parties state the process is biased against them despite electoral commission assurances that it will be credible. “This is a critical moment in Zimbabwe’s democratic journey,” said Ellen Johnson Sirleaf, former Liberian president and a leader of one of the international observer missions. “The elections today provide an opportunity to break with the past,” Sirleaf said at a polling station in a school in Harare. Past elections were marred by violence, intimidation and irregularities, but Mnangagwa, a former enforcer for Mugabe who says he now represents change, has promised that this election will be free and fair. The presence of Western election monitors for the first time in years is an indicator of a freer political environment, though concerns have been raised about State media bias toward the ruling party as well as a lack of transparency with the printing of ballot papers. Email “Mugabe hopes his former party will lose Zimbabwe election”. Feedback on “Mugabe hopes his former party will lose Zimbabwe election”.